It was good to see a “no-name” win the U.S. Open. That’s probably a little bit harsh but let’s face it. Who had heard of Graeme McDowell before yesterday – professional golfer from Northern Ireland who played his college golf at University of Alabama, Birmingham? He went up against the likes of Phil Mickelson, Tiger Woods, and the elite of the golf world and he prevailed. At Pebble Beach on a nasty day, when it was hard to watch what the wind was doing to their game, Graeme McDowell prevailed. And after he sank the last putt, winning the tournament, his father ran out onto the green and embraced his son; a fitting end to a great game on Father’s Day. Here’s what stuck out to me. 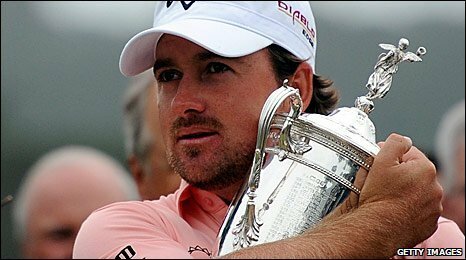 Was Graeme McDowell and overnight success? We sometimes think that these kinds of things just happen: right place, right time, lucky, everyone plays bad, you play good, and we dismiss it. But let’s stop and think about it. McDowell said something that stuck in my mind. He said, “I’ve been on the putting green since I was ten years old.” I remember reading in Malcolm Gladwell’s best-selling book, “Outliers” the importance of 10,000 hours. To really be great at anything, you have to invest 10,000 hours in learning and growing and allowing that thing to become a part of you. Living in Nash-Vegas, I see way too many people who go for their quick success. They leave their home in Oklahoma, or Ohio, or Texas, or West Virginia, and they move to Nashville hoping to be discovered. Having lived here awhile, here’s what I’ve learned: there are no overnight successes in golf, music, or any other thing. The people who prevail and become champions do so over time, not overnight. So remember this. A kid from Northern Ireland who played his college golf in Birmingham, Alabama can win the U.S. Open. But he’s going to have to give years and years and years of his life to do so. And so will you. If you’re discouraged today because you’ve been at it and you’ve seen little fruit in your business, your church, or even your marriage, remember: even Graeme McDowell, U.S. Open Champion had to start on the greens when he was ten. How old is he today? A lot older than ten.